ChatterPix Kids: Bring Any Image To Life! This poem was created by one of my darlings in class using the BookCreator app. No inspiring or theory supported quote is needed when a child approves of something you are doing in class. The child’s belief in a program (that is educational and occurs in school) is evidence enough that it is working. We are edging dangerously close to the pitfall of a school year in which the students have forgot how to show control and teachers feel burned out. Sound familiar? I have found the best solution to saving a teacher or a classroom from burnout is to take a step back and look at what is working well, what is not, and what can be changed relatively easy. One thing that needed to be changed in my classroom? Optional creation apps. My students are very familiar with how to use fantastic apps like Book Creator, Strip Design, Popplet Lite, and many more. They can create and incorporate multiple apps into one project. Basically, they are iPad ninjas. I needed something new. Valuable creation apps can be difficult to find and even more difficult to find for free, so when a colleague sent an email to everyone in the school singing the praises of a free ChatterPix kids app, I was skeptical. ChatterPix kids? Is this for the little guys? No, this is an app that can transform ANY photograph into a talking movie! A student simply loads the photo, chooses where to place a “mouth”, record themselves talking, and saves to the camera roll! What is even more exciting is the fact that these videos can be imported into other apps such as Book Creator or iMovie. The last two weeks my students worked on a Poetry eBook. This is a collection of poems created by the students using the Book Creator app. Now, they could go back and bring those poems to life by adding relative ChatterPix videos to the page! 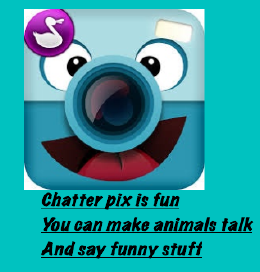 We have also used ChatterPix kids in Science. After learning some key characteristics of magnets, students loaded a picture of a magnet and had the magnet talk about what “made it special”. Viola! Review and assessment of who remembers the properties of magnets, done! Image what you could do with this app! Share how you have used this app in your classroom below!